It's a game-changer. Groundbreaking. The Marvel movie you've been waiting for. With Black Panther now just hours away from hitting cinemas, are the expectations getting to Chadwick Boseman, the man on whose shoulders the latest release in the Marvel Cinematic Universe rests? "No," the actor says, "that's what everybody else is talking about. At this point, we're just sharing it with the world." Still, even Boseman admits to having his moments on this one. As the first black superhero to get a major stand-alone movie, and with a majority black cast, Black Panther is a big deal not just for Boseman and Marvel, but far beyond. "The read-through that we did with most of the cast present, that was the first moment where it sort of hit home," Boseman says. "Then we had some scenes where almost all of the characters were present - and they're big numbers, even if it was a musical." Black Panther, the comic book character invented by Stan Lee and Jack Kirby, made his debut in 1966, a time thick with anti-war and civil rights protest in the US. The character entered the MCU just two years ago, when the studio decided there needed to be a neutral party between Captain America and Iron Man when the Avengers allies split in Civil War. A prince of the fictional African nation of Wakanda, T'Challa lost his father the king in the events of Civil War. In Black Panther, he returns home to inherit the throne - as well as the suit and claws of the nation's superpowered protector, the Black Panther. 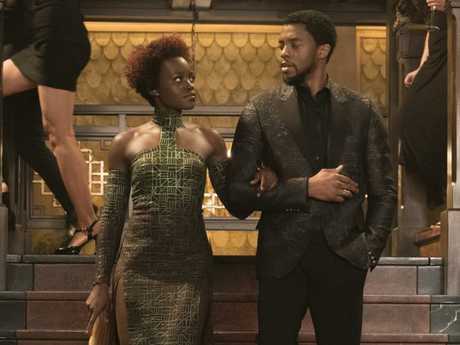 Lupita Nyong'o and her “easy on the eye” co-star Chadwick Boseman in a scene from Black Panther. 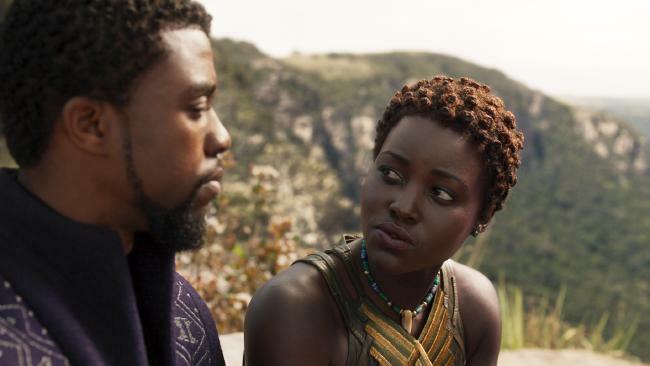 While the movie has a globetrotting James Bond vibe, most of the action takes place in the technologically advanced Wakanda and its surrounding plains. The film's director, 31-year-old African-American Ryan Coogler, spent time in South Africa to get a taste for the continent. Boseman had already had a DNA test years earlier that showed his roots go back to Sierra Leone. He says connecting with his African heritage is an ongoing process. "That's a constant learning experience because there's so much of a disconnect that part of it is an informational, hands-on process and the other part is a spiritual process. But that is definitely something that has begun." Born in South Carolina in 1977, Boseman was initially studying to be a writer-director. He only tried acting in order to figure out how to communicate with actors. His first screen gigs were one-offs in crime or medical dramas: Law & Order, CSI: NY, Cold Case, ER. His movie breakthroughs came back to back, playing baseball legend Jackie Robinson in 42 and the Godfather Of Soul, James Brown, in Get On Up. Neither film got a release in Australia, meaning the actor was largely unknown here when he came out to shoot Gods Of Egypt in 2014 and even when Civil War hit cinemas in 2016. Another of his lead outings, last year's Marshall - a courtroom drama about America's first black Supreme Court Justice - also wasn't deemed viable in this market. 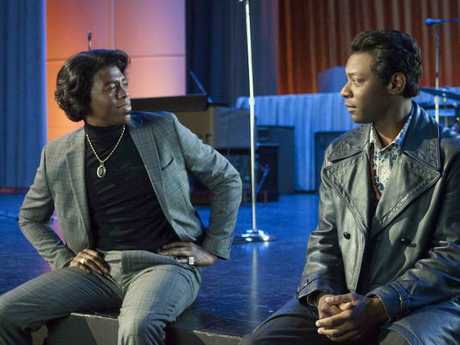 Chadwick Boseman, with Nelsan Ellis, as the Godfather Of Soul in the James Brown biopic Get On Up. "It's unfortunate that those films didn't get released in Australia because I think regardless, things that are detailed and distinct are universal," he says. "Hopefully, Marvel will break that barrier." When the idea of bringing Black Panther into the MCU was first raised, Marvel Studios' honcho Kevin Feige swears Boseman was the first and only actor mentioned to play T'Challa. The team was clearly sensing what Lupita Nyong'o - who plays T'Challa's ally and love interest Nakia - learnt when she got to the Black Panther set. "There's an ease with which Chadwick fills the shoes of the Black Panther and I feel like he was destined to play this role," she says. "He's a natural born leader, a very generous, empathetic, sympathetic guy." And, she adds with a laugh: "Easy on the eyes, I must say. Chemistry was not a problem." While we'll have to wait to see how those declarations about Black Panther being a game-changer for the MCU play out, what is certain is Boseman's character, and Wakanda, play a pivotal role in the upcoming Avengers: Infinity War (April 25). But where Infinity War will find our heroes facing a giant purple dude from outer space, Black Panther is more rooted in the real world. Thematically, it touches on everything from refugee crises to isolationism. As head of state, T'Challa has very real problems on his plate. "What's real-world about him is the internal conflict of being a leader and dealing with the results of his actions," Boseman says. "Like, those actions affect an entire country and, inevitably, affect the world. That's a very real thing. "Although it is a superhero movie and it exists in some ways in the realm of fantasy, more so than any other Marvel film this is rooted in a reality and conflicts that are very human." The major source of conflict in Black Panther is Killmonger, played by Michael B. Jordan. A mercenary who shoots and steals his way to Wakanda to challenge T'Challa for the throne, he has very different ideas about how to deal with those problems on the king's plate. "Killmonger is very much talking about taking the fight to people and I think he's learnt that from the imperialism of the rest of the world, not from any black leader," says Boseman. "I love that fact that T'Challa's humanity, his worldview and his growth would be challenged by a character like Killmonger." 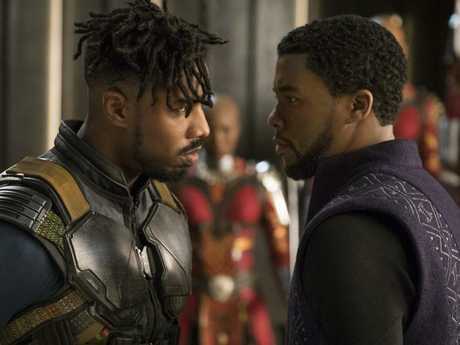 Michael B. Jordan’s Killmonger and Chadwick Boseman’s T’Challa face off in a scene from Black Panther. The two actors enjoyed playing out the clash of their opposing ideologies, both intellectually and physically. "I relished the idea that you could have two actors that usually play leads go toe to toe with each other," says Boseman. "And the idea that his character presents a conflict with Wakanda that is an African-American and African debate on a stage of this stature, I think will heal ourselves and heal others."